Arch rivals Mytholmroyd provide the next, considerable hurdle as Booth bid to complete the third leg of a very rare four-timer on Sunday. The pair meet at Blackley in the Halifax Parish Cup final (1.0) with Booth hot of the trail of back-to-back trophy doubles. Only Triangle (1993-94), Copley (1973-74) and Mytholmroyd (1943-44) have won the top section title and lifted the cup for two years running in the last century. 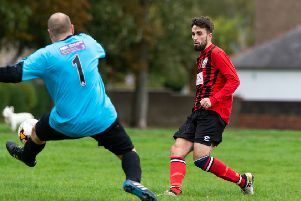 Booth won the Premier Division by an eight-point margin last year and comfortably accounted for an under-strength Copley in the cup final. They have made the most of a favourable draw in this year’s cup competition, while Royd have had to battle past Thornton and Jer Lane, and hold a handy seven-point lead in the Premier Division with seven rounds of fixtures left. However, Booth do throw in the odd bad performance, like last Saturday at Thornton when they were bowled out for 79, so success in Sunday’s Briggs Priestley sponsored game is far from a formality. The showpiece game is a rematch from the 2009 final at Sowerby Bridge, which Booth won under Jim Mosley. Mytholmroyd are joint third in the Premier Division and a high-scoring encounter is on the cards, given decent conditions, if the two meetings so far this season are anything to go by. Booth won them both, the game at Royd in May producing 601 runs and the recent rematch another 593. Both sides are expected to be at full strength, with Royd skipper Tom Earle seemingly confirming his participation after earlier plans to be away on honeymoon after getting married on the eve of the season. Batsman Tom and all-rounder brother Jack are key men for Royd while siblings Richard and Rob Laycock have so often been match-winners for Booth. But if there is one person under particular scrutiny it could be Steve Senior, the Booth opening batsman who left Royd early last season and has already had knocks of 139 and 84 against his former teammates this summer. Booth will be favourites to drew level with Mytholmroyd’s nine Parish Cup final wins in many people’s eyes. Laycock had to sit and suffer with a broken thumb while his teammates let victory slip through their fingers, with several dropped catches, in the 2013 final against Jer Lane at Sunday’s venue. The all-rounder believes a return to Blackley will hold no terrors for his players after last year’s final success. This is Laycock’s sixth final, after two wins and three defeats, and most of the Mytholmroyd side have also played in Parish Cup finals before, some with other clubs. Jack Earle and Jamie Cowens are among the long-serving ‘Royd players without a winner’s medal. They were in the losing side at Sowerby Bridge two years ago when Triangle came out on top. Tom Earle, successful in Royd’s winning side in 2005, didn’t play in the 2015 final due to a holiday. Tom Earle said: “I always think the semi-final is bigger than the final. Now we have got there we can have a day out which is good for the club. “There is a danger you can build it up too much and not perform but it should be a good final. Booth: R Worsnop, S Senior, Rob Laycock, H Wajid, Rick Laycock, J Midgley, N Horsfall, P Thomas, U Saghir, M Ayub, R Cockroft, S Butterworth. Mytholmroyd: J Earle, M Scholefield, L Sutcliffe, S Hassan, T Earle, T Ahmed, T Conway, A Gawthrope, J Travis, J Cowens, A Azam, G Spink.